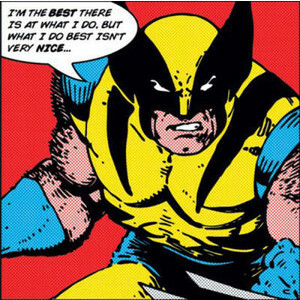 The story behind the quote: The quote comes from Wolverine, everyone’s favorite yellow spandex wearing, cigar chomping Canadian mutant. He is probably the most popular and most recognizable X-Men character in the world today. Which is kind of astonishing since, originally, his first appearance was in Hulk #181 (as an opponent to both The Incredible Hulk and Wendigo). It wasn’t until much later that Logan joined a new group of X-Men to rescue the original members. Logan pretty much acknowledges that he is a vicious killer and will do things that may seem unnecessarily violent. But he does recognize that his skills do serve a purpose as noted by his catchphase. Geek wisdom: Everyone has his or her own special talent and, no matter what it is, it’s something that you should be proud of. There may be times when you feel your special gift should be hidden away or it should be something you should be ashamed of. But everything you’re good at has to be shared with everyone… because it deserves to be shared with others.